Namibian-born photographer Kyle Weeks grew up exploring the wide-open landscapes of his country and being among the Himba people who populate the northern Kunene region. Since studying his craft at Stellenbosch Academy in South Africa and relocating to Cape Town, he’s been constantly drawn back home to try and capture a new view of this much-documented, semi nomadic tribe who have long been immortalised as regal yet ‘other’ by photojournalists. His 2014 series Ovahimba Youth Self-Portraits focused on young single men looking fly in their best sportswear. Now Weeks’ latest series Palm Wine Collectors reveals the rarely witnessed practice of tapping the sap of Makalani trees and turning it into a nutritious moonshine called otusu. 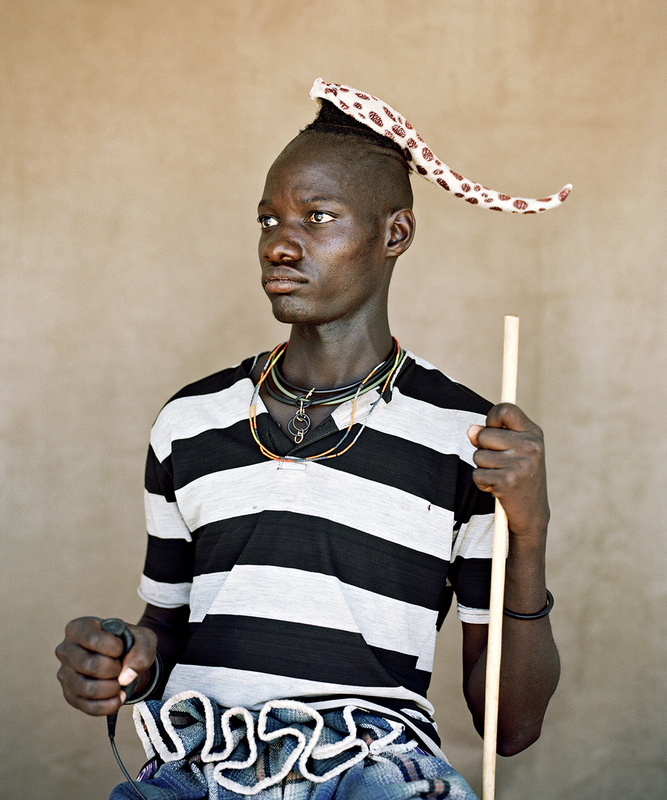 These more formal portraits assert his subjects’ powerful relationship to their environment. Concerned with the politics of identity and the ethics of representing the African body, Weeks’ lens flips historical ethnographic photography on its head. Ahead of his solo show at the National Art Gallery of Namibia in August, he discusses the trajectory of this on-going project. What drew you to shoot the Himba people? It struck me that how they are usually represented in photographs is very different from the reality I knew. The government promotes them as an unchanging culture to tourists yet their society is evolving all the time. The youth is influenced by globalisation and western media - they own mobile phones - and yet they still have a strong kinship to their own traditions. I spent two years with Himba men who were the same age group as me (18-26), which allowed me to see that they are just like young men of any other culture trying to find a balance between modernity and tradition. For Ovahimba Youth Self-Portraits, I decided that they should take control of the way they are represented and so handed them the shutter release. This mitigated my influence on the final outcome. They expressed themselves in the outfits and poses they chose. Their hairstyle – a single plait – indicates that they are unmarried as well as their respected social standing as herdsman. How did Palm Wine Collectors evolve? I printed posters of all participants in the self-portraits series and returned to the area last year to try and find everyone and give them their poster. I ran into one man who was delighted with his poster and immediately led me to climb a tapped palm and drink with him. I’d never seen it before it struck me as another important facet of their culture. kinship to their own traditions"
It tastes horrible! The sap rises to the top of the beheaded palm and sits in a carved out hollow that they make in the trunk. It is then left in the sun to ferment into a warm, milky pulp. Men arrive at a palm tree early in the morning, which is when I’d take the portraits, and it transforms into this social space with groups gathered around drinking until well after sunset. So these palms are a kind of make shift bar? Yes. There is singing and whistling and getting drunk. But what I also learned is that during the dry season when cattle can’t graze, the Himba move to be near the Kunene River to tap these trees because the wine is an important source of sustenance. It keeps them from going hungry. The activity has gone on for generations. It is now banned by the authorities for nature conservation reasons but one of the chiefs in the area told me that the law is little enforced and they stand strong because they believe it is their right on their ancestral lands. What are your other current projects? I’m co-founder of Cape Collective Assist, which provides lighting and digital crews for stills shoots in South Africa. I’m also developing a portrait series in Cape Town with grass cutters and will continue my long-term project in Namibia shooting areas of interest and creating a narrative. I’m becoming interested in merging fact and fiction through photography and building new African identities.